Spider Removal Experts Suffolk County | EcoTech Pest Control Inc. The eight legged insect that scares most people are common around the house. You can find them making webs anywhere. Outside they can make some pretty impressive webs, but you wouldn’t want them inside. Creeping and crawling around the house, sometimes even in your bed. Get rid of them fast, call EcoTech pest control for fast relief and peace of mind. There are 3,000 species of spiders in North America. Here are just a few common spiders found on Long Island. 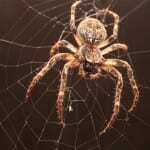 These spiders have an average body size of about 1/4″ long with legs spread out it could be up to 1″ long. The House Spider is light brown in color with different shades on the legs. The female spider can lay up to 400 eggs in an egg sac. These spiders feed on flies, mosquitoes, ants, wasps and sometimes larger insects depending on their size. They create webs, wait for a vibration along their web, then they follow it to their prey, wrap it up and lastly paralyze the prey. A House Spider builds their webs in human habitats. They like quiet areas, like behind doors or furniture, in attics or any household crevice. The American House Spider will only bite if threatened, grabbed or squeezed. Their bites can cause pain, but are usually harmless. There are many different species of the Black Widow Spider found in the United States. Their size varies from 1/8″ to about 3/4″ in size. The female Black Widow Spiders are dark brown or shiny black in color. As they mature, some may have red spots or red or orange hourglass shape on the bottom side of its abdomen. The male Black Widow Spiders sometimes have red or red and white markings on the top side of its abdomen. These spiders construct a web of irregular silken fibers. They like dark, undisturbed areas, like basements, cellars and under furniture. The Black Widow Spider hangs near the center of it’s web, waiting for small insects to get stuck. Then it bites the prey and wraps it in silk to be eaten. These spiders are not aggressive towards humans, but can bite if threatened, grabbed or squished. Their bite can be dangerous and result in severe muscle pain, spasms and cramps and can last for several days or weeks. These spiders are usually 1/4″ to 3/4″ in size. They can be light brown to dark brown or blackish grey in color. Most typically have markings that look like a violin with a black line coming from it.This spider has three pairs of eyes, unlike most other spiders. The Brown Recluse Spider can tolerate no food or water for a long period of time. They build irregular webs in woodpiles, sheds, garages, basements, furniture, clothing or fabric that has been kept in one place and other dry quiet places. They also prefer cardboard when they are in our homes. This spider eats roaches, crickets or any soft bodied insect. The Brown Recluse Spider is not aggressive, but can bite if pressed against. Its bite can be dangerous and cause a multitude of symptoms. Commonly called Daddy Long Leg Spider. It’s body is about 1/8″ to 3/4″ with its legs it can be over an 1 1/2″. They are grey to brown with banding markings. They build irregular webs in dark and moist areas like a cellar. They can also be found in warm dry places like an attic or around windows. They wait for prey to get tangled in their web, then they wrap it and bite the prey. Some species of the Cellar Spider eat other spider and eggs by vibrating the web of other spiders to lure them out so they can attack the host spider. The Cellar Spider can bite but their venom is not toxic to humans. These vary in type and size but are about 1/2″ in length. They are a pale color with brownish tint to the mouth and eyes. The Sac spider may also change color after eating a meal. They like small tight spots for protection. They travel by creating silk strands to swing on. These spiders are more aggressive than most spiders and can bite if they get touched while in bed or underneath fabric. Most bites are harmless but can leave you with a skin irritation and bite mark. These spiders can be 1/2″ to 1 1/8″ in size. Their color is camouflage depending on their habitat. The Wolf spider is one of the few spiders that have excellent eyesight. They are unique in that the Wolf spider carries its eggs instead of leaving them to hang on a web. Most of the time they can be found in shrubs, gardens and homes. The Wolf spider is usually harmless unless continually provoked. They can bite and cause irritating side effects. Vacuum all webs around your home regularly. Keep basements and attics clear of clutter so it wont be so easy for spiders to find shelter and build their webs. Always shake out any clothing that has been sitting for a long period of time. Also check your clothing or items when coming in from outdoors. Spiders can also enter your home through cracks or holes so check and seal holes around your house doors and windows regularly. If you suspect you have an infestation in your home, contact your licensed exterminator, EcoTech Pest Control (631) 887-3028 or (516) 226-0988 to locate and remove these spiders.